The rain that had watered the runner beans and hanging baskets while we were in Surrey had finally given way to the odd patch of blue sky and sunshine by the time we got out into the garden to plant the new arrivals, purchased yesterday. With Bumble still incapacitated by her injured ankle, she set to weeding all the buttercups out of the border by the cottage from a seated position, while I was charged with planting the Lupin, Scabia, Foxglove and Sweet Peas. The rain had turned the soil into a wonderfully moist texture, compared to the arid dust of just a few days ago, and the smell as I dug the holes was very cathartic. B was busy creating a huge mound of uprooted buttercups when she suddenly found her new friend. Wondering what was tickling her leg, she looked down to see a rather large snail that had decided she was more tasty than the vegetation it had been hiding in. 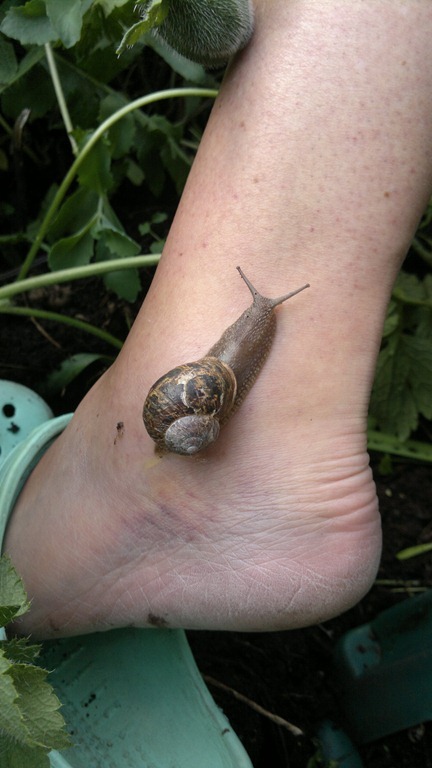 Mr Snail was a very friendly chap, not the usual shy retiring sort that hides in his shell when you pick him up. It was very interesting to be able to inspect such a curious little creature at close range, and it made me realise just how much wildlife, apart from the ever present birds, we share the garden with. Sometimes beauty comes in some rather unexpected forms.